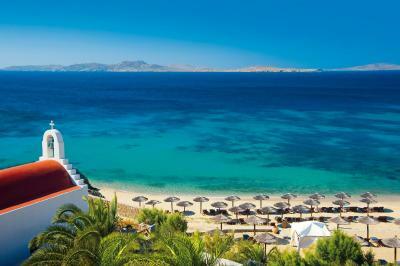 Lock in a great price for Mykonos Grand Hotel & Resort – rated 9.6 by recent guests! This property was spectacular!! From the moment we were greeted at the front door, we were treated like royalty. We were led to the VIP room to check in over a glass of bubbly. What a nice touch! Our rooms were gorgeous and had a private rooftop terrace with a hot tub, swinging bed, lounge chairs and a dining area that we availed on the last night with pizza delivered from a local restaurant to watch the sunset over dinner. The breakfast buffet was abundant and the lunch and dinner restaurants were fantastic. The staff were always available and very friendly and helpful. The spa was a lovely experience as well. It was a quick local bus right to town, so great location. I highly recommend this resort. Fantastic in every way!! We booked and Executive Suite with a hot tub and when we arrived, they upgraded us to a Suite with a private pool. It was huge two room suite with two full bathrooms and a beautiful patio with a private pool. The view was amazing and the staff and the service was top notch. 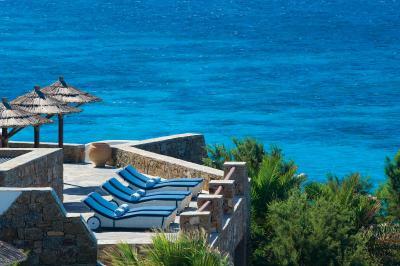 This resort is on a small, quiet beach and it has it's own lounge chairs on the beach for hotel guests. This was a beautiful property. We were there at end of season, so it was quiet, but it was perfect for us. I would highly recommend this property for a romantic getaway. I don't think this beach is one of party beaches of Mykonos. It is a bit out of Mykonos town, but there was a free nightly shuttle that went to town every hour in the evening, so it didn't even matter. Our room was fabulous! Vicky treated us like royalty! Excellent property but a little far from town. They have buses in the evening. 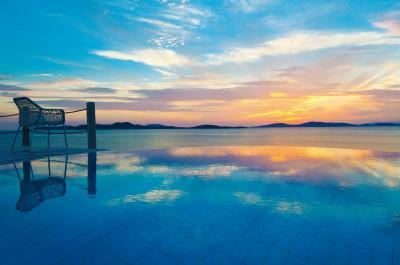 Staff was very professional and courteous, and the hotel itself is stunning. Thanks to all for making our stay an unforgettable one. The staff was incredible, they treat each guest as a VIP and will get you anything you need at anytime. It is no doubt one of the best hotels you can stay at and I rank that up to Ritz Carlton and better. If you know the Ritz you will love this place. Food is beyond unbelievable, the salt water pool with the views is one of the best experiences I have ever had and I am a world traveler. There are famous people at the highest level of society that stay at this hotel. You will not be disappointed. Location, very well kept grounds and pool area, great access to lovely beach area. Bus service into town . Most staff were very friendly and eager to help and service extremely attentive. 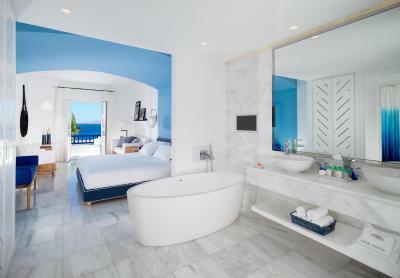 The room was so clean and modern with outstanding views, fabulous bathroom, all outstanding . Lovely hotel would stay there again . Service was impeccable, staff always ready to help. Food at pool bar and breakfast were amazing. 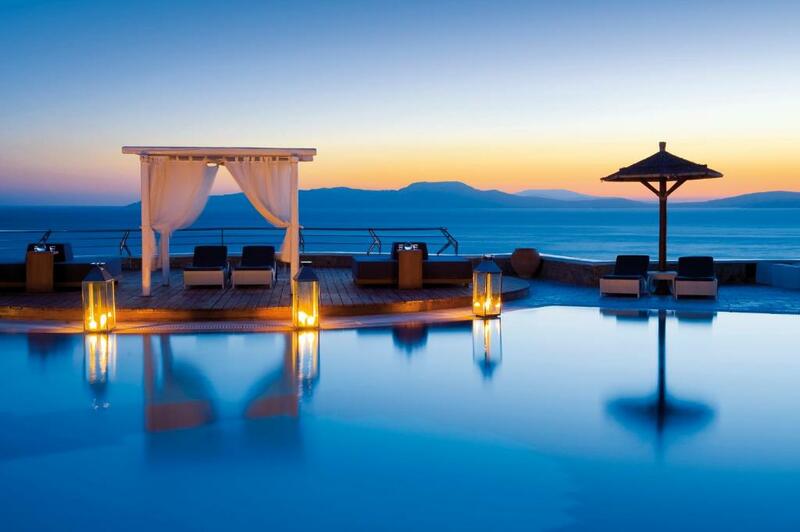 Beautiful heated pool. Beautiful property-Service is excellent!!! Room, pool and sharing pool were fantastic!!! 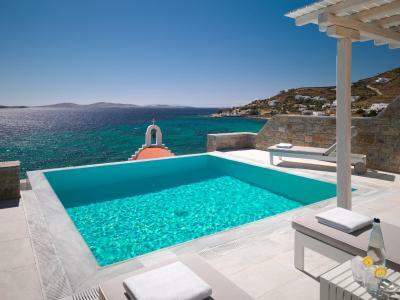 Mykonos Grand Hotel & Resort This rating is a reflection of how the property compares to the industry standard when it comes to price, facilities and services available. It's based on a self-evaluation by the property. Use this rating to help choose your stay! 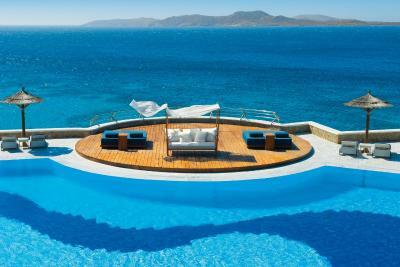 Located right on Agios Ioannis Beach, Mykonos Grand Hotel & Resort provides 5-star, boutique accommodations set amidst cobble paths overlooking Delos Island. It includes a health center and features fine dining in stylish settings. 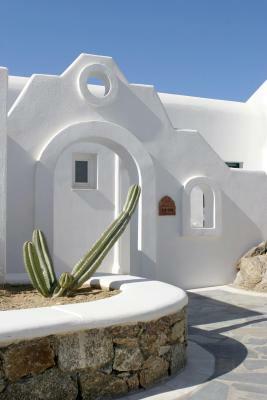 Rooms and suites at Mykonos Grand combine the cube-shaped Cycladic architecture with the soothing interior décor. They come with a satellite LCD TV, DVD player and iPod docking station. All units open out to balconies or patios with sea, garden or pool views. 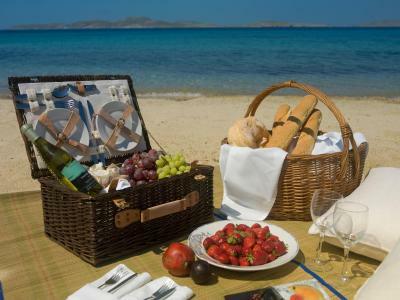 Guests can enjoy fresh seafood, grilled specialties and other Mediterranean flavors either at the open-air dining room or by the pool offering panoramic sea views. 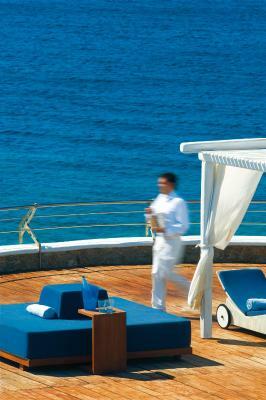 The White Bar is ideal for a glass of champagne in a minimalist setting featuring an outdoor terrace. 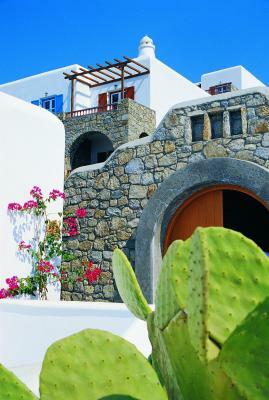 The cosmopolitan center of Mykonos Town is about 2.5 miles from the resort. The island’s port and airport are both 3 miles away. Free Wi-Fi is available throughout and free on-site parking is available. 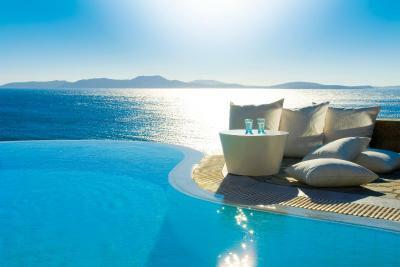 When would you like to stay at Mykonos Grand Hotel & Resort? This room features an open-plan bathroom with an egg-shaped bathtub, a walk-in rain shower and a steam cabin. 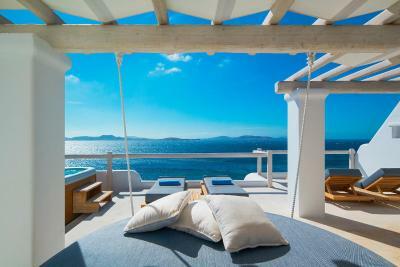 It opens onto a balcony with panoramic views of the Aegean Sea. Enjoying panoramic views of Agios Ioannis Bay, this suite offers a private pool with furnished sun terrace and BBQ facilities. It also includes 2 luxurious bathrooms, a guest toilet, a free-standing bathtub and a steam cabin. A chef can prepare exclusive meals upon request. Please note that the pool can be heated on request. Located on the top floor, this suite features a spacious terrace with a hot tub, a daybed and a wooden pergola overlooking the sea. It consists of a living room, 42" TVs and 2 bathrooms, one of which has a steam cabin and a bathtub. 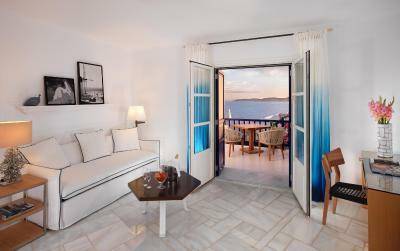 Featuring panoramic views of Agios Ioannis Bay, this 2-bedroom suite includes a private pool with furnished terrace and BBQ facilities. It also has 2 luxurious bathrooms, a free-standing bathtub and a steam cabin, as well as a walk-in closet. 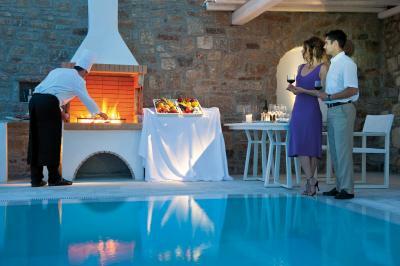 A chef can prepare exclusive meals for guests upon request. 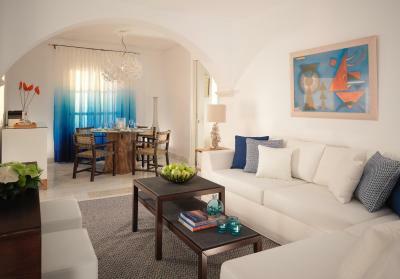 This two-bedroom suite offers view of the Aegean Sea. 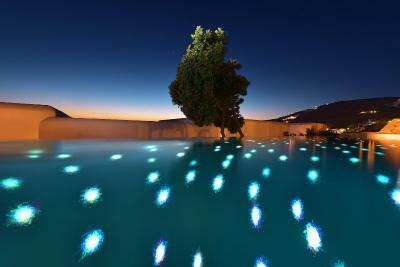 It features a furnished terrace with infinity private pool, BBQ and a shaded dining area. The master bathroom has a deep soaking hot tub, walk-in rain shower and steam cabin. 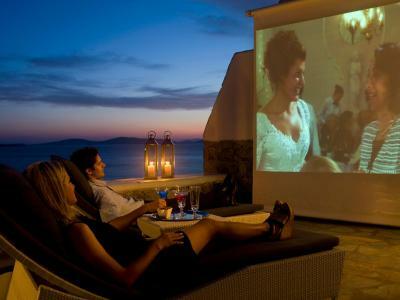 A separate living area offers three 42'' TV sets, DVD players and iPad speakers. 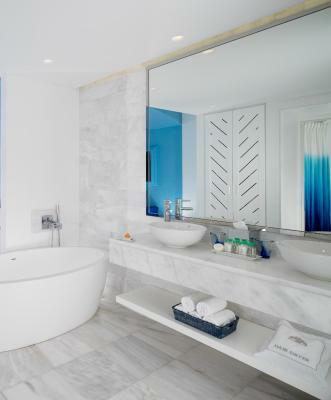 With Aegean Sea views from its terrace or balcony, this air-conditioned room features marble floors and a spacious sitting area. It has a flat-screen, satellite TV as well as a bathroom with a walk-in rain shower and a free-standing bathtub. Free Wi-Fi is available. Located on the ground floor, this elegantly decorated premium room opens to a private terrace with garden views. 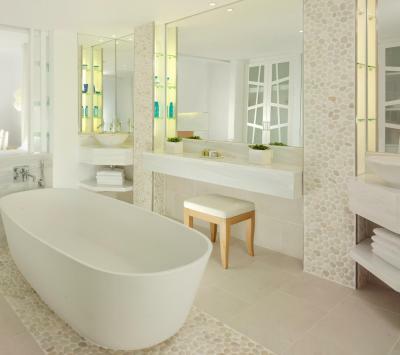 It has a bathroom consisting of a walk-in,rain shower and a free-standing designer bathtub. Offering direct access to a communal pool, this room features garden views and includes a bathroom with a rain shower and free standing bath. 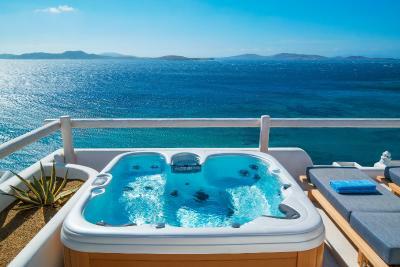 Offering views over the Aegean Sea and Delos Island, this tastefully decorated, spacious suite consists of a bedroom, a separate living room with sofa bed and a bathroom with separate shower/steam cabin, separate WC and a bathtub. 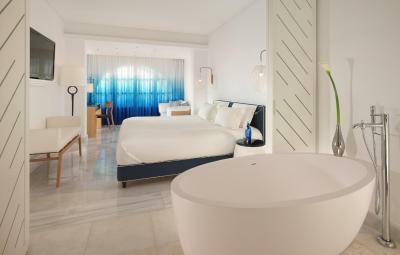 Opening to a terrace with views over the Aegean Sea and Delos Island, this elegantly decorated suite consists of a spacious bedroom, a separate living room that with sofa bed, a wet bar and dining facilities. It also has a free standing bath tub and 2 bathrooms, one with shower/steam cabin. 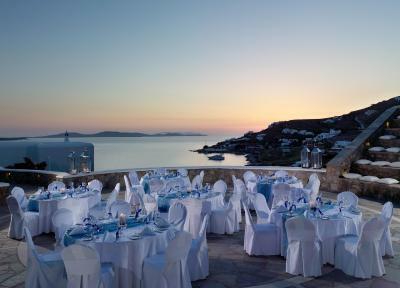 House Rules Mykonos Grand Hotel & Resort takes special requests – add in the next step! 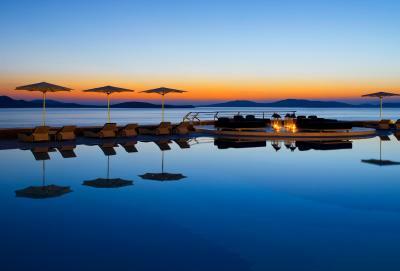 Mykonos Grand Hotel &amp; Resort accepts these cards and reserves the right to temporarily hold an amount prior to arrival. Mykonos Grand Hotel & Resort accepts these cards and reserves the right to temporarily hold an amount prior to arrival. My only complaint is the resort recommended restaurants that were far away and cost a lot to take a taxi to that was not worth the money. It would have been better to recommend restaurants closer to the resort. It was colder outside than we wanted! Too many stairs, elevator rides and mazes of walkways between the beach, restaurant, your room and the reception. think its overpriced for what it offers. breakfast was average for a 5 luxury hotel. have seen far better. bus to city is a great idea. pity they dont have it running around multiple spots in mykonos. Hotel à little maze like to get around. Fabulous staff, beautiful hotel, good beach, nice big pool, very good breakfast, excellent recommendations of where to eat and what to do. Shuttle service into town very good. I didn't like the fact that I had to leave, I wanted to stay more....it is an amazing place. Smell of stale cigarette smoke in foyer, especially when we arrived.. this was was our first impression of hotel . Smoking in restaurants and no designated areas for smokers . Occasional member of staff not very friendly or helpful, although most were outstanding . Nothing bad to say about this hotel / really exceeded our expectations. Small feedback would be the light that shines in the rooms through the bathroom window. The service was unbelievable. Hotel staff is extremely attentive to the detail and the entire team, from room service to pool bar to reception has been helpful and an absolute delight to deal with! Customer service was best on the world. Transportation to town was crowded!! !